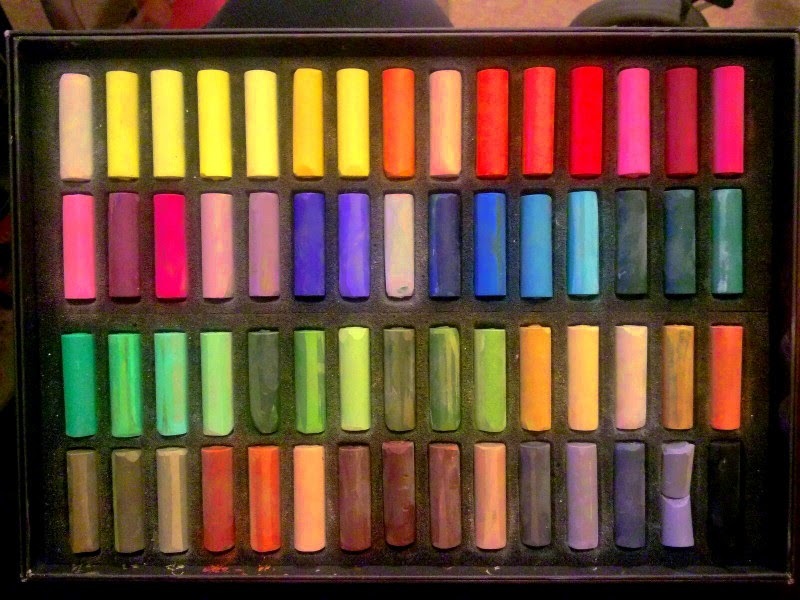 Back in 2004 or 2005, an oil painter friend gave me a box of 60 vintage Rembrandt pastels. He got the set from an oil painter who tried the medium and didn't like it. He'd tried the medium and didn't like it. The box dated back to the early 1950s or earlier, it might even have been older than I was! The pastels were wonderful, just as good as the 30 Grumbacher assorted and 30 Grumbacher Skin Tones that I originally started with back in 1992 when I became a street artist in New Orleans. I soon found myself taking up pastels again. I didn't review them because they were antiques. Rembrandt had changed its formula more than once since then, some pastel artist friends warned. There'd be no way anyone would be sure of getting vintage ones. So I went on trying other brands, got Senneliers, got Art Spectrum, got a number of hard pastels sets and other brands and samplers. I didn't think of writing about Rembrandt. Friends and teachers including Charlotte Herczfeld described Rembrandt as "Good workhorse pastels." She used Rembrandt color numbers for her listed Colourist palette in her free class "Still Life the Colourful Way" on WetCanvas, which completely revolutionized how I paint and view color. Still, I used my old ones as part of a mixed brands set and didn't think about getting more until recently. Rembrandt like many other brands came out with a good 120 color half sticks set. This makes them great for beginners. You can get a good large palette at half the price with twice the colors. Moreover, Rembrandt's palette is extremely well balanced! They were sold out on the big half sticks set when I ordered. I'll still get it sometime to have a nice big studio palette. What I realized was that I could do far worse for plein air than to get a good 60 color half stick set in a sturdy compact set box and a trusted artist grade brand. Maybe "Workhorse" medium texture pastels were just what I needed! I looked over the pictures of the 60 and 90 color palettes and discovered to my pleasure that everything essential is in the 60 color range except one stick. I can easily transpose one stick in later on and plan to - it could be improved by swapping out one of two gray-browns I rarely use for a deep dark violet that I often use in landscapes. That's personal. Someone who used gray-browns more than I do might not want to. This is one of the better balanced 60 color sets I've ever seen. Important hues like violet, turquoise, magenta aren't just there but there in values too. I've got a selection of darks, brights, neutrals, lights around the spectrum and that slightly toned stick at upper left is actually a white. It's just a little smudged. Because I used this box so much last month! Once in a while an art supply comes along that is so useful it literally changes my habits. I wound up painting in pastels more thanks to the compact palette and versatile textures of the Rembrandt 60 Color Half Sticks Set. I'd recommend the full range if you want an anchor set of medium-soft artist grade pastels with good lightfastness, open stock easily available for replacements, moderately priced and available in places around the world that don't always enjoy the variety we get in the Continental USA. Rembrandt is a solid value. Their texture is medium soft. They're firm enough to create hard pastel effects, linear strokes, tiny details with edges of sticks. They're soft enough to scumble or do some basic impasto strokes though they won't go on as juicy as Sennelier or Terry Ludwig. You can use them from beginning to end and have a good painting on sanded or unsanded paper. 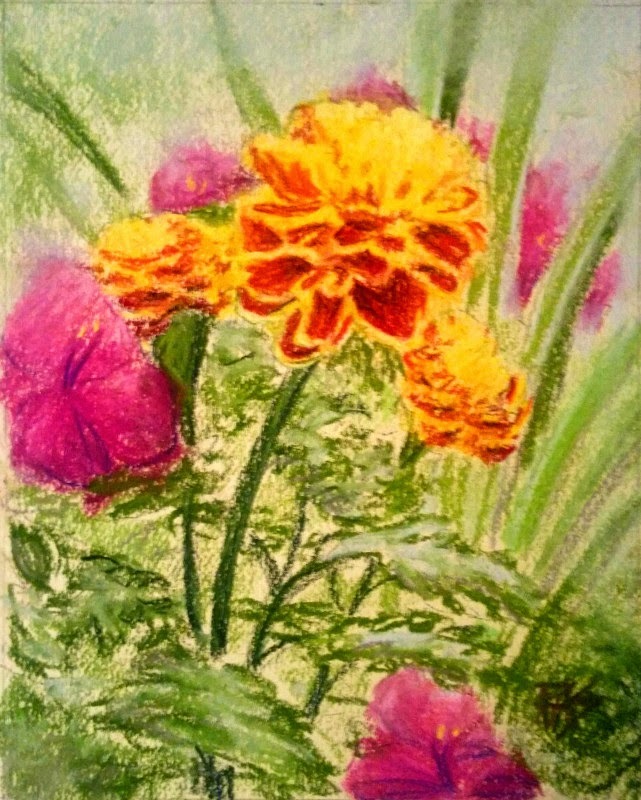 on Aquabee Hemp Draw unsanded paper 9" x 12"
I wound up doing eight pastels the month I bought them and 13 pastels this month. That's how much this little set affected my habits. From doing pastels perhaps once or twice a month I went to prolific sketching and painting. Something about the sheer convenience and flexibility of this bright little range made them much easier to use than specialty pastels I bought in smaller ranges or very large sets that took more setup and cleanup. I admit some of that is personal and has to do with my life situation. If it's next to me and I don't need to get up, I'm more likely to use an art supply more often. I collect pocket sets and field kits not because I go out to paint every day, but because at least nine times out of ten I'm using it to set up in a very small space and do not have room to spread out something like my full range Pan Pastels or 200 Winsor & Newtons. I bought those knowing they were discontinued for a bargain - and trusted I could use Rembrandt similar hues to replace any I used up. So why not get an actual set of Rembrandt too for convenience? It worked. A half stick set this size and this well thought out in palette can help anyone who paints with limited space. I cut pieces of sanded paper to size 9 x 12" or smaller, painted on Uart and in my pastel journal as well as on the Aquabee and Canson Mi-Tientes pads. Pacific Wave, 5" x 7"
On sanded paper I got all those textures and varied effects entirely using this set of half sticks. The best seascape I've done in my life happened on impulse when I saw a reference that brought back memories of the Pacific coast. I was able to get tiny ditails of spray, heavy impasto strokes in the foam, linear marks, side strokes, scumbling, layering, stick-mixing, every technique I know worked in that quite small space with these pastels. 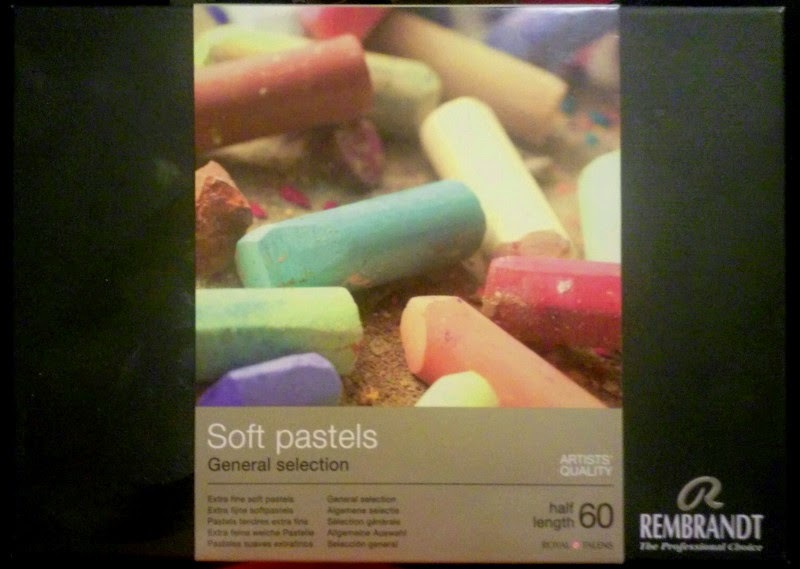 Pigment rich, consistent in texture, reasonably priced and well organized for hue and value, these are the first artist grade pastels I would recommend for any beginner. I'd also recommend a 24+ color set of hard pastels for sketching and underpainting and a 20 or larger set of Sennelier half sticks for finishing marks when you've filled the paper tooth - also to give the beginner a feel for different softness of pastels and how to use different textures. The finishing ones don't need a full palette, they need darks and lights and some accent colors. Some beginners get confused at a very large range and choke on making so many choices. Others like me thrive on a big range and love having many choices available. This has all the necessary colors and some very useful convenience colors. Thanks to Charlotte Herczfeld, I think of neutrals as convenience colors now but there are many useful ones and good earths in this range. The rich textures of these pastels are very different from the standard super soft student grade pastels. Uncrushed pigment crystals shine if you don't finger blend them, soft gradients can be achieved by stick blending as well as finger blending. You can learn on these - and then rely on them over the long run, building up earlier layers and using more expensive pastels in final layers. One warning for Rembrandt buyers. The first time you try to make a side stroke with a half stick or peel the wrapper off a full stick, you may find it hard to make a mark at all. There is a "coating" on the outside of the sticks. The tips don't always have it or it comes off on the first mark, but it can be very frustrating. Sand that off with a sandpaper paddle. Just the kind you'd use to sharpen pastel pencils or soft graphite leads. It doesn't take much to remove it. I was swiping it off on the borders of paintings on sanded paper or even scrubbing through it on margins of regular paper to get a smooth plane to paint with because that coating also kept my fingers relatively clean. Your choice to sand it all off or just sand down one side to paint with. I think the "coating" comes as a side effect of the extrusion process, compacting the paste as it goes through the tube before it dries. It's there on almost all colors, it's not a big deal to remove and no great loss of pigment. Just be aware of that and don't think yours are defective if it occurs. The box is excellent - a sturdy heavy cardboard box in black with the R logo swashing across it gloss on matte, very elegant, and a cardboard sleeve that keeps the box firmly closed. The lid flips over and slides under the bottom with the top tray in it and a little pamphlet about the product with the entire color range listed by color number is included. The cardboard sleeve includes tiny swatches with color number for every pastel included in the set. Very useful for reordering or for customizing - if you'd rather change out several colors for those you use more often, it's not difficult to get some full sticks from open stock and just store the displaced extras and other halves elsewhere in your studio. Open stock usually comes in padded small boxes good for storage or they can go in a mixed brands box for general use. I seriously recommend 60 half stick Rembrandts as a plein air set, the palette is well balanced for any climate I've lived or subject I might run across. If I want to paint a woman on the park bench, the flowering bushes in front of the fountain, a colorful city street here in San Francisco or a bunch of palms near the ocean, I can do it. I could manage a decent Southwestern painting with this range. For a general use palette it is superb. I can't praise it enough. But then, my varied subjects for the past few weeks are why I can say that. In convenience, it really does matter what colors go into the small portable sets - sometimes so much they blow all the rest out of the way! Autumn Sunset 5" x 7"
I was able to get the impression of frost on the fields in that little sunset and the fine details of those receding distant trees. Not just the bright sunset colors I wanted but the subtler hues on the land were easy with very little layering since I was doing it on unsanded paper. These are the ones to learn on and the set to have with if you feel like painting outdoors. If you don't want to put together a custom plein air set with multiple brands in a Guerrilla Painter pastels tray box and build a personal palette, you'll still get good use out of these and be able to start right away. 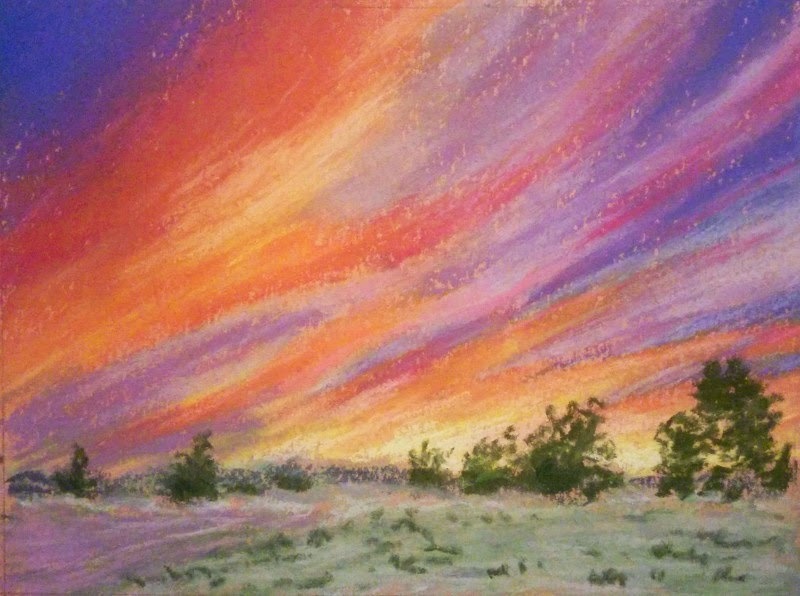 The beginner's artist grade pastel is just what Charlotte Herczfeld said: a good workhorse. We go off in many different directions but this old friend keeps on being a good friend. Also for beginners - 60 is a good manageable number. Bigger palettes are easier but smaller palettes may prove difficult or specific to subject, 60 will usually be about right for general use. Yes, I'd buy more of these and I'd even get the full range along with my W&N set given more studio space. This old friend still pulls through and opens up so many possibilities. Besides, I still have vintage colors to add to it. Hi could you please answer a little Q. 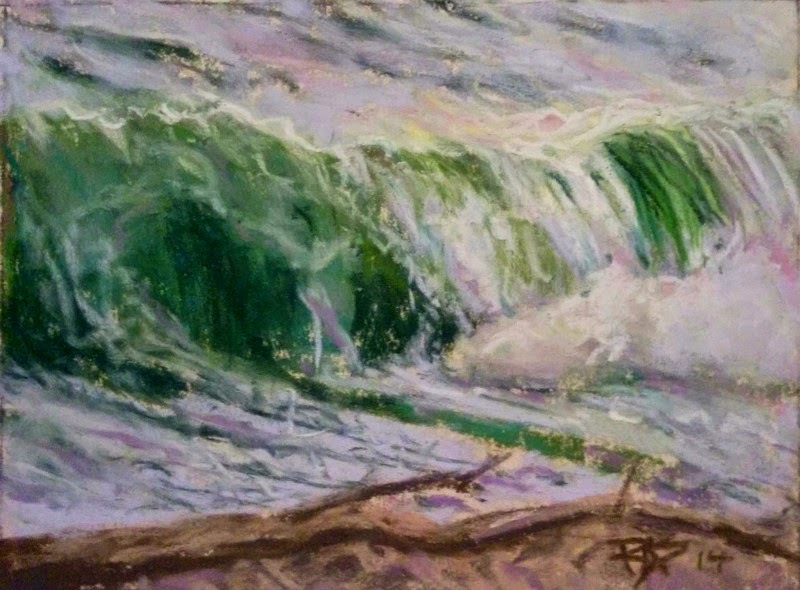 The pastels im using at the moment are not good when it comes to clouds & waves. the white does not seem to want to appear white on the page. they appear grey. Im considering Unison or Rembrant soft pastels. in your opinion would this give better clearer results & do you have a preference of pastel? I like your work & want to do similar with good results but feel the tools are letting me down & holding me back.